Found in dry stony/gravelly slopes, creosote bush scrub. A common desert shrub of northwestern Mexico and the southwestern United States. Its common name comes from the brittleness of its woody stems. It is also called incienso because its dried stems were burned by early Spanish settlers as incense. 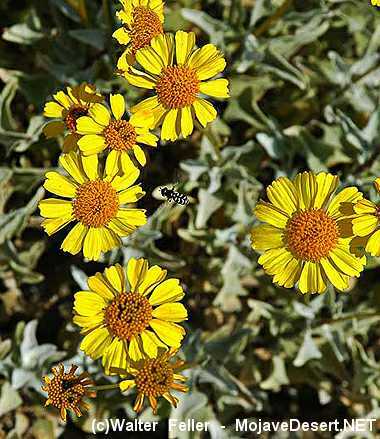 Encelia farinosa grows to 1 m tall, with fragrant leaves 3-8 cm long, ovate to deltoid, and silvery tomentose. The capitula are 3-3.5 cm diameter, with orange-yellow ray florets and yellow or purple-brown disc florets. They are arranged in loose panicles above the leafy stems fruit 3-6 mm and there is no pappus.